On the Main Line: Maimonides and his faithful frum servant Peter. Maimonides and his faithful frum servant Peter. Maimonides was suspected of heresy by the rabbis of Spain. The rabbis of Germany decided to send an emissary to meet him personally and see if the charges were founded (I know!). They sent a Rabbi Meir. Upon arriving, Rabbi Meir was, uh, perplexed at the things he witnessed in the Maimonides household. First, a servant placed food which looked like human hands on the table. Secondly, the Rambam summoned another servant, named Peter, to fetch wine for the guest. Finally, Maimonides ordered that a calf be slaughtered for him in a quite unlawful fashion. Completely shocked at the obviously unkosher food (human hands, wine served by a non-Jew, and unschechted meat) Rabbi Meir managed to mumble excuses and didn't eat. Later Maimonides approached him and asked him his impressions. Not being able to answer for fear of offending his host, but obviously assuming that Maimonides was guilty of preparing the treifest of treif dishes, the Rambam explained. First of all, the human hand was a special kind of vegetable which only looks like it is a human hand. Secondly, his faithful servant Peter is Jewish. Hasn't Rabbi Meir ever heard of the Talmudic sage Rabbi Yose ben Patrus? Thirdly, the calf was removed from the womb of a pregnant cow that was slaughtered according to halacha. As you know, the law is that such a calf does not need to be slaughtered according to the method of shechita. Rabbi Meir understood the lesson: do not jump to conclusions about other people without understanding the complete picture. Having learned this great lesson, he returned to Germany and reported that the Rambam is no heretic. The aforementioned Ma'aseh Book is in fact the written source of this story. 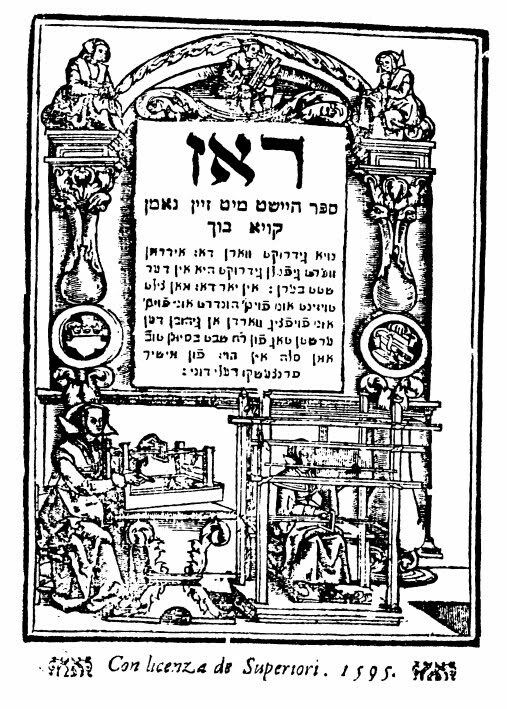 As you can see, the full title was Ein Schein Maaseh Buch ("A Beautiful Story Book"). The title page begins by asking the "dear Men and Women to come here" and peruse the book. The stories, it says, are all from the Gemara, with some from the Midrash Rabbos, Bachya, and that the stories about Rabbi Yehuda Ha-chassid are not to be missed. In addition, there are stories from the Sefer Chassidim, Sefer Mussar and the Yalkut. Then comes a great line: איר ליבן ארויאן איר האט פון דיא טייטשי ביכר אל ואר איצונדר האט איר אך דיא טייטשי גמרא / Dear ladies, you already had German books; now you will have the German Gemara! And who published it? A Litvak. Okay - he was from Mezerich. I don't know how many copies of the 1602 Maaseh Buch there are, but the first edition of this book would seem to be incredibly rare. In a late 19th century catalog of the Bodleian Library I saw it claimed that only one copy was known (its copy). A few decades later Israel Zinberg writes in History of Jewish Literature that there are three known copies. For all I know a few more have turned up. In addition, there are extant a couple of manuscripts of the book. Gaster's English translation (1934) was preceded by Bertha Pappenheim's translation of the 1723 Amsterdam edition into German (which you can read here). Some random tidbits. 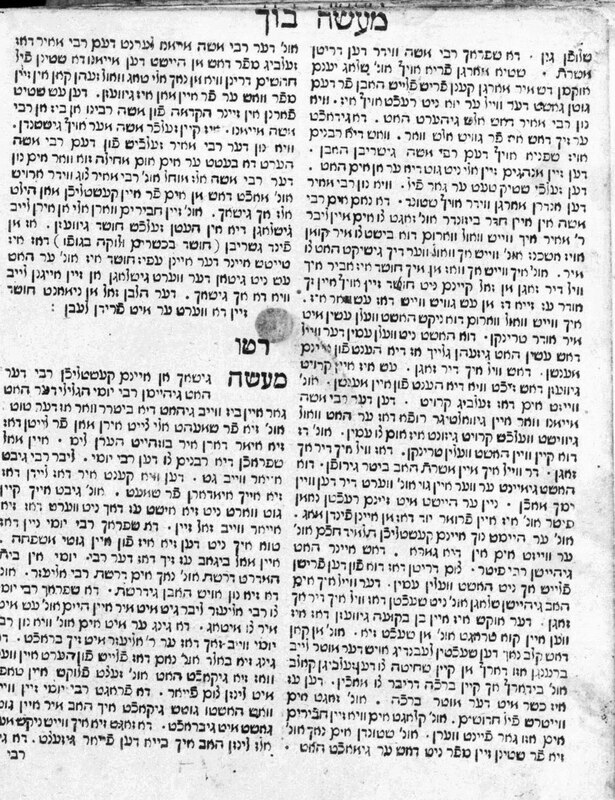 Throughout this version (and three other Maseeh Buchs I looked at) the Rambam is called רבי משה מיימנו. No, that is not a typo. מיימנו. Evidently for the not-so-learned audience, just who he is is explained very carefully. He is a "Gevaltiger Herr in der Torah." As in the Jewish Press version, the story takes place in Spain (which the Rambam fled as a young man). The משרת, or servant, is called פיטר (so all those fancy versions which call him Patros aren't actually being faithful to the source). Not surprisingly he is not called a גוי but איין כותי, a "Samaritan." The Rambam informs Rabbi Meir that Peter is not only Jewish, but he is איין פרומר יוד, he is a pious Jew! The identity of the Talmudic rabbi named Peter (the father, really) is not given. Rather, we are told that a talmid chochom in the Gemara was called Rabbi Peter. 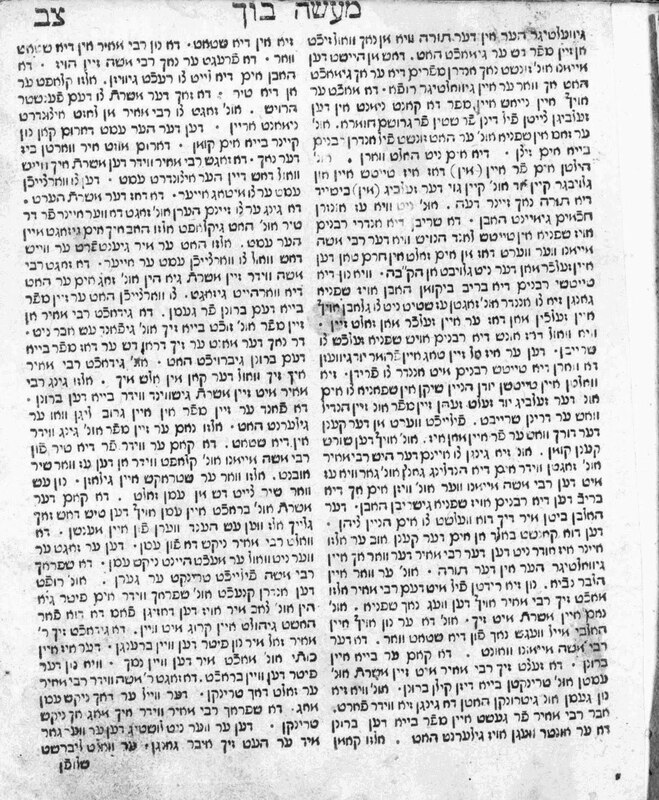 After asserting that this Rabbi Meir is the one who coined the famous aporophism that "From Moshe to Moshe there was none like Moshe," at the end the reader is exhorted that חושד בכשרים לוקה בגופו, for suspecting the innocent, the penalty is flogging. 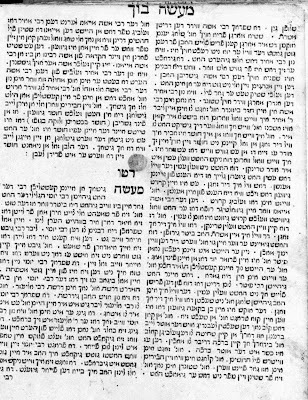 In case anyone thought that the idea that the content and doings of a Chassidisher newspaper in New York can quickly become general knowledge is something new (for example), one should consider that many oral tales of the Jews were already available in translation only 9 years after their first printing. The pace may have quickened, but the concept is really the same. Or the supplement Ma'asei Adonoi, which was subsequently incorporated in later editions. 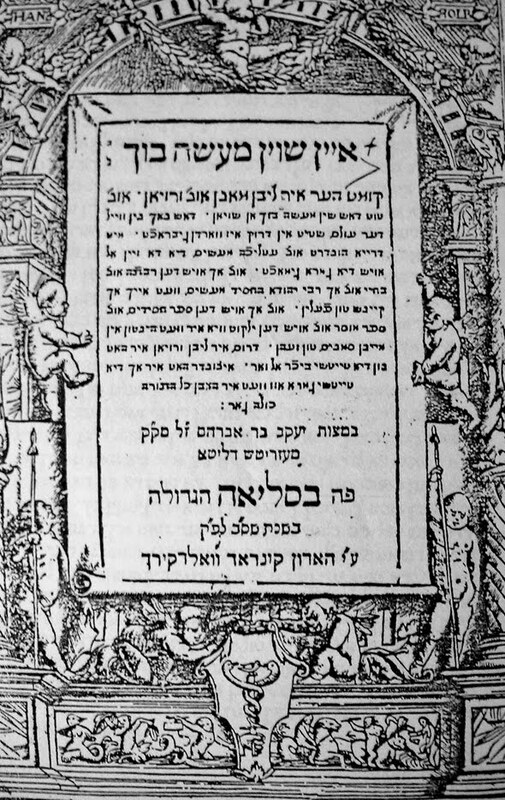 Since I could not see the original 1602 edition of the Ma'aseh Buch, or a copy of Ma'asei Adonoi, I'm not sure where it first appears. Steinschneider in his article on the Maaseh Buch in Serapaeum seems to say that it's in the original, but I'm not 100% sure. Very interesting. Although it specifies Mezritch d'Lita, which is not the Mezeritch you probably meant to refer to when you wrote "okay, he was from Mezritch"
"In a late 19th century catalog of the Bodleian Library I saw it claimed that only one copy was known (it's copy)"
Anon 1. It was meant to be tongue in cheek, but thanks for pointing that out. 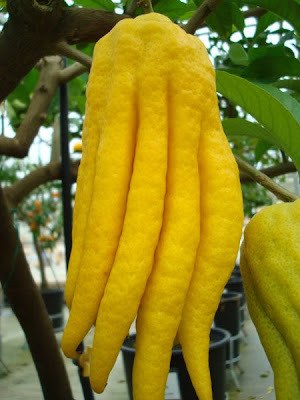 The story is told of the bachurim in shanghai during the war, that they were given an esrog with fingers to use on succos as there were no real esrogim. Some used it without a brochah, and others didn't use it at all. Is this the same fruit, or is there another one that looks similar? 1) Segula recently had a feature article on Bertha Pappenheim/ Anna O. 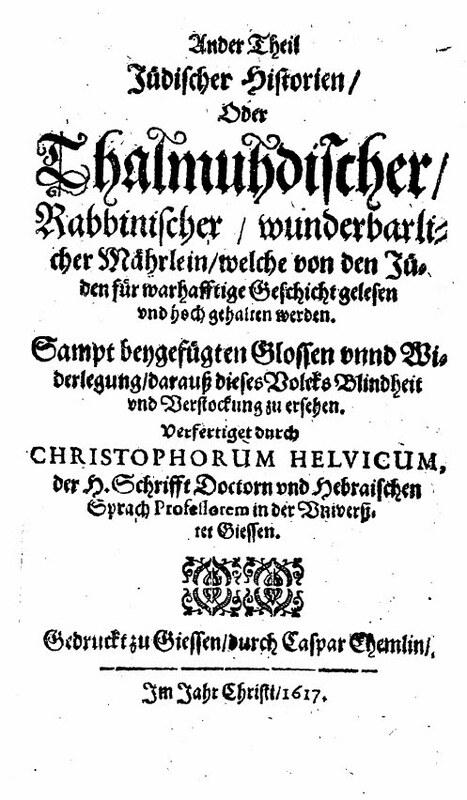 2) I find it interesting that according to legend the rabbis were not concerned about whether he believed in the resurrection or kabbala or was corrupted by Aristotelean philosophy. They just needed to make sure his shechita was good. They sent Rabbi Meir to question him about resuurection and kabbala. While there, the Rambam decided to teach them a lesson in dan lekaf zchut. Is there anyone who discusses whether Maimonidies was allowed to place a stumbling block in front of the blind? What was the stumbling block, was the calf not chsidishe shchita? The calf wasn't geshochten at all. Besides, Peter was obviously a modernishe, or at least a Byzantine. so what's the מכשול, maybe he tricked him but if there's no איסור then where's the מכשול? considering that rambam was probably not even a bar mitzvah yet when his family fled spain, and that he lived most of his adult life in egypt (which is where he became and then practiced as a physician), it's hard to understand how this rabbi meir visited an adult dr. maimon in spain. Can you please tell me where I can see a copy of the Maaseh Buch? 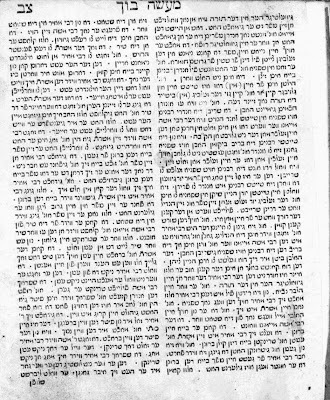 I would like to see the source for the Shlomo Hamelech / Chess story in the source qouted by Yellinek in his sefer BHM. Thanks! Hi, sorry for not noticing your comment until now. 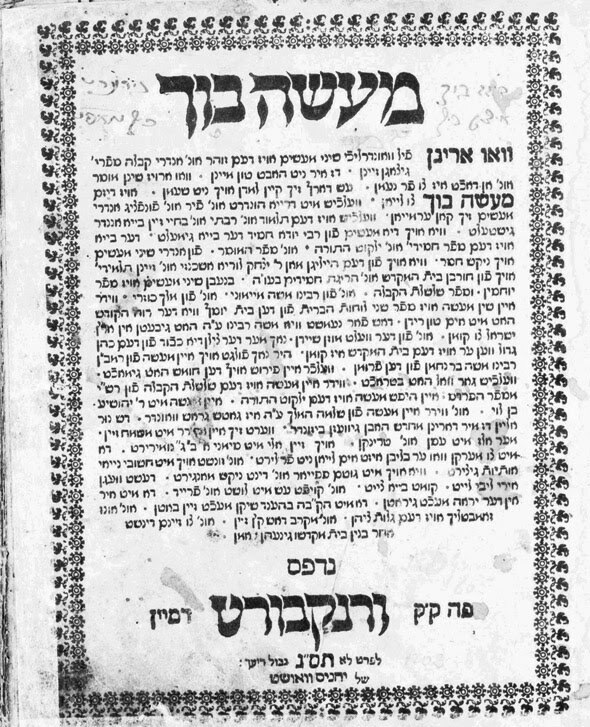 If you look at the links on the bottom of this page you will see several versions of the Maaseh Buch. Not the Moses Sofer you were thinking of.